This new 10-megapixel lens will maximize the performance of your high resolution camera. 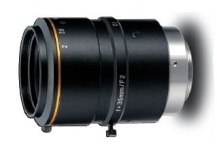 It delivers fantastic image detail, with 200 lp/mm resolution at center, and 160 lp/mm at the corners. Kowa's broadband coating and floating mechanism design greatly reduce chromatic aberration. You can expect beautiful results across the entire visible to near-infrared spectrum, at all working distances. Even if you're not using a 10 megapixel camera, this lens will deliver superior image contrast, which often translates into superior inspection results. Length shown is with lens fully extended.